The Saint-Gobain product line includes our revolutionary single-skin protective ONESuits and ONEGlove that offer lightweight protection without the use of overcovers. All of the ONESuit products are certified to NFPA 1991, the most stringent standard for protection from chemical/biological agents, including liquefied gas. ONESuit protective hazmat suits are lightweight for maximum comfort, and include the ONEGlove Hazmat, the first and only single-piece chemical protective glove certified to NFPA 1991. The ONESuit range provides the ultimate in safety, comfort and mobility in any type of hazardous situation. "Elliotts has partnered with Saint-Gobain to provide the Australian market with the highest performing Hazmat suit system available on the market. The ONESuit has seen international take-up from first responders looking for the best possible protection in hazardous situations. Elliotts' aim is to provide quality safety gear and ONESuit is a major part of safety product range." Anthony Elliott. ONESuit® Flash meets the needs of those working in the most dangerous environments.Certified to NFPA 1991 plus flash fire protection, this single-skin, lightweight protective garment protects against chemical and biological agents in both liquid and vapor form. ONESuit® Gard is engineered to meet the protection and comfort needs of those working in the most dangerous environments. The marriage of Saint-Gobain Performance Plastics technical expertise to real-world input from hazmat professionals has produced the single-skin ONESuit® Gard. ONESuit® Pro - Maximum Protection. Affordable Price. 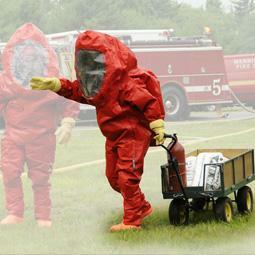 ONESuit® Pro is the most affordable chemical protective suit certified to the NFPA 1991 standard. It is also the only ensemble certified to NFPA 1991 and NFPA 1994 Class 2, IMO SOLAS Type II-2, EN943-1 and EN943-2:2002, offering the highest levels of protection against chemical and biological agents. ONESuit® Pro is the latest innovation in single-skin hazmat suits from Saint-Gobain Performance Plastics, allowing for excellent maneuverability and user comfort. Consistent with the ONESuit® brand, ONESuit® Shield was engineered to meet the needs of hazmat professionals seeking the highest levels of chemical protection. ONESuit Shield combines uncompromised protection with exceptional comfort in a Level B configuration. Certified to CBRN First Response and Chemical Splash standards, this lightweight and durable garment provides enhanced mobility for performing the most demanding tasks. The ONESuit range is designed to make sure that every person who puts his or her life on the line to deal with spills accidents and other dangerous situations understands the benefits, and the importance, of fully certified protection.